From Emerald City Comic Con, 2011. Copic markers and ink on 9 x 12 bristol. Well I'm back on the east coast again finally, and putting my nose back to the grindstone. Had a fantastic time over in Seattle and Oregon. Really amazing catching up with so many comics folks out there, including Mr. Kurt Busiek and Chris Samnee and their lovely wives, as well as the karaoke fiends that are Mike and Laura Allred. They were kind enough to invite Maris and I over their house on the Pacific coast while we were there. Besides being enthralled by the amazing location of their place, and the jaw-dropping amount of original artwork they have adorning their walls, we were excited to find they also had their own karaoke machine! We jammed out both there and later at Portland's own Floating World Comics, where I had the pleasure of meeting its friendly and vocally talented owner, Jason Levian as well as writer Jamie S. Rich. 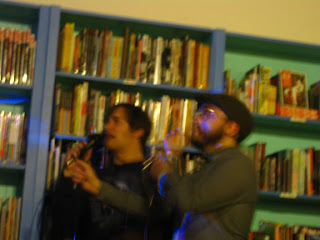 Above is the only blurry evidence of Mike and my duet of 'Science Fiction/Double Feature' from Rocky Horror Picture Show. Okay that's all for now, folks! Back to drawing! Who was the Karaoke king that night? Nice Lois Lane! You definitely captured the "intrepid reporter" expression. I can't wait to see who they cast in the new film, I'm not sure any actress has quite nailed the role. Ah, Miss Lane, on the trail of the next big story. Great sketch, you can see the gears moving! Christina - This is untrue. I like silver dollars too much. 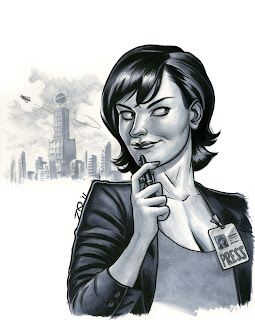 Munchanka - Thankee :) I thought Margot Kidder definitely nailed the Lois Lane attitude. But yeah, I am curious as to who they will finally cast. I like Mary Elizabeth Winstead for the part. In fact, that's kinda who I was thinking of as I drew this one. Appears they went with Amy Adams for the next Movie. I love her work, but I think of her more as bubble brained and less cunning. So she would get her story with a wink and sweet talk more than a scowl. What do you think?